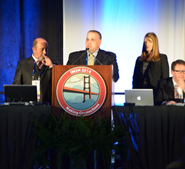 The Society for Simulation in Healthcare (SSH) announces record attendance at the 14th Annual International Meeting on Simulation in Healthcare (IMSH) held January 25-29, 2014, at the Moscone West Convention Center, San Francisco, California. Nearly 3,000 attendees enjoyed this year's abundance of learning and networking opportunities. 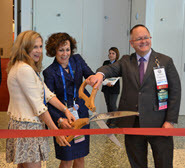 As the world's most influential healthcare simulation conference, SSH Members reviewed over 1,000 abstract submissions before building an agenda of over three hundred courses. The theme for this year's conference was "Making Connections" and was woven into the daily offerings at the conference. Tom Dongilli, Director of Operations at WISER, was one of this year's co-chairs for the conference and was responsible for its planning. Mr. Dongilli also served as oversight for the 1st Annual "Sim Ops Symposium" that was offered the day before the conference began. Dr. Paul Phrampus began his role as past President for the SSH. In this role he will still serve on the Board of Directors in the Society as well as be a resource for the current President for the Society. The 2014 agenda offered an array of essential topics to support the learning needs of the multidisciplinary participants. Several WISER staff members served as presenters at this year's conference: Dr. Paul Phrampus, Tom Dongilli, John Lutz, Kevin Miracle and Daniel Battista. Mr. Battista also served as a Track Chair for this year's conference. WISER also participated as a vendor at this year's conference. WISER staff was on hand to speak with individuals interested in the course offerings and programs that are offered at WISER. WISER looks forward to next year's conference which is taking place January 10-14, 2015 in New Orleans, LA. * 'The New Order of Things': How Does it Happen? * How Do I Create a Policy and Procedure Manual? * Positions at a simulation center. What exactly do I need and who can fill that role? * Cost Structure: What Should We Charge?